When Randy and I first got married, I had no clue what I was doing. No clue. I wouldn't have admitted it then, but, safely in the future, I freely admit it now. We both have had a hand in creating exactly what God didn't intend in a marriage, but I honestly believe if I had known some things and practiced them from the beginning, it would have made a huge difference. The cool part to this laborsome confession is that I recently found a book that pretty much itemized every mistake I've made in the last 3 and half years. As with anything, reading a list of dos and don'ts won't grow you a perfect marriage overnight but I think if I had read, taken to heart and tried to practice some of the attitudes this book talks about, our relationship would have been different from the get-go. 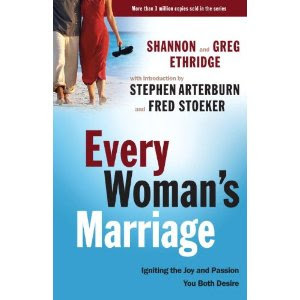 So, this week I'm going to try to do an extended (loose) book review of "Every Woman's Marriage" by Shannon & Greg Ethridge. The point for me is to stay accountable and conscious of the bad attitudes and ideas I can so easily slip into if I'm not careful. Writing about them helps that a lot for me. I'll start on the book tomorrow but today I have to build a context. As we've talked about before pride is such a silent poison that if you don't point it out, label it and keep on the lookout for it, it'll get you every time! Pride is the thing I brought into marriage that has prompted some of the ugliest moments in my relationship with Randy. Dwelling on what I deserve, offended at what I didn't deserve, expecting everything but putting in very little, assuming him (and the rest of the world) is just like me, or at least they should be - all of these things sprung up because of the pride problem. All of it comes back to how worthy I feel like I am and then demanding appropriate behavior. And when I say demand, I also mean beg, nag, reprimand, throw a fit, mean-spirited, etc. Ultimately, getting my way and what I thought was right, important, best, whatever, was what it always came down to. Learning to swallow my words regardless of how deserving I thought I might be, is the best peace and unity seeking tool I've ever discovered. Anyway, I say all of that to let you know how royally messed up I can be and am from time to time. On the other hand, I am really happy (blessed, content, whatever word you prefer) in my marriage. Haven't always been, but over the past several months I have been more and more. Not because I'm great. Not because Randy is perfect. But because God is good and merciful in allowing me to learn to be better. I hope you are happy and if you are - share with me some of your secrets! Maybe it's all in my head, but a lot of people don't seem happy. And everyone has burdens that I'm sure I can't begin to understand, but through some major mess ups and a nice summary in this book, I'm trying to learn how to make life, full of worry and pain, not a burden at all because of who is standing next to me. And if it can help you or prevent you from making some of the same mistakes as me, yay for you!